How to Check and Fix Duplicate Content on Your Website? Blog » On-page SEO » How to Find and Fix Duplicate Content on Your Website? 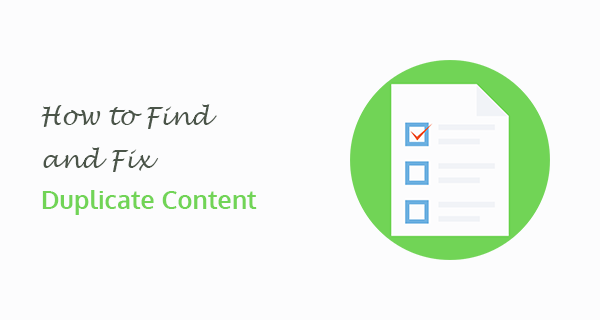 How to Find and Fix Duplicate Content on Your Website? Duplicate content issues can drop any website ranking considerably. To attract more traffic to your website, every business should focus on content marketing. When creating content, you can face content duplication issues on your website. Especially if you are using a content management system such as WordPress. It is famous for creating duplicate pages which can affect your Website’s SEO. In this tutorial, we will discuss tools to find out duplicate content and how to fix those content issues. A block of content that has been copied internally on a website or by external sources (content piracy). Both of these content issues need to be fixed to achieve a great user experience throughout the website. How to find out Duplicate Content on your website? Google Search Console mainly report duplicate meta tag issues, which most of the times help find the duplicate content pages. However, Google Search Console sometimes doesn’t report duplication issues or sometimes it takes time to index and report those issues. If you don’t find issues reported by Google Search Console, it doesn’t necessarily mean that your content is safe. I always use multiple tools to check duplicate content on a clients website. Siteliner is one of those tools which helped me a lot to find duplicate content. You can use Siteliner to find duplicate content blocks or broken links on a website. It is a great and highly recommended tool to fix those particular issues. You just need to type your website URL in the search box. Siteliner will provide a comprehensive content analysis report for free. You can browse the report on the site or download content analysis report in a variety of formats. It can help you find out content that has been copied by other websites. You can use it to find out if your blog posts and pages are getting copied. However, it won’t tell you much about duplicate content blocks on your website. Also, if you hired a writer to write content for your business, then you can check if it has been copied from some other famous blog within your niche using Copyscape. If you moved content from old URL variation to the new one, then you can use a 301 redirect. For example, if you have a page example.com/buy-cars-2017/ and you have updated the content for 2018 by changing the URL to example.com/buy-cars-2018/. In this case, you can redirect the old 2017 URL variation to the updated one. It will help you move the link juice from old URL variation to the new one. If your website has 2 identical content pages with different URLs, you can use the canonical link element. It will help Google to understand which of the 2 identical pages that you want to be shown in the search. You can also use a canonical attribute when you are syndicating content to other websites and social platforms. Similarly, you can use Noindex and nofollow tag, in case you want search engines to completely don’t crawl and index a particular page in SERP. It’s a meta tag which means it can be included in the HTML < head > section of a page. Similarly, you can use robots.txt file to allow or disallow pages to be crawled by Googlebot. If you are using WordPress, then you can check out these useful WordPress SEO plugins to optimize your content to the next level. I hope you find this post useful. If you like this post, please follow me on Twitter or subscribe to my newsletter. You can also check out my link building services if you need to boost your ranking after content optimization. Hello Sir, I have a website siteliner is showing 42% of duplicate content for this. How to solve this? Thoroughly check each URL reported by Siteliner to understand what kind of duplicate content exists. If these are tag archives or date archives pages, then you can place a robots meta tag with a noindex attribute. If you do this, make sure that you also remove these pages from your xml sitemap.